If the Sun is our own will and the Moon is what would be acceptable by others, how would we manage to combine these two; to perform the "secret marriage"? One way to do this is to follow the path of Mercury. Mercury has a rather complicated symbol. The circle of spirituality is combined with the cross of matter and the semicircle of the soul, which turned upwards symbolizes receptivity from the universe. This receptivity passes then through the self (subjectivity) and is coordinated according to our personal views and to serve our personal goals. What this says in simple English is that we turn around, observe, gather knowledge and try to make something practical of it to help us stay alive. And in order to do so, we need to be both open to the "other" like the Moon and concentrated to goals like the Sun is. To be more precise, in astrology we say that Mercury rules the logical process of analysis and the information exchange. It discusses the information as a topic and gets into the process of seeking it, sharing it, transforming it or collecting it. It doesn’t exercise any moral judgment, neither signifies the information as good or bad. As we'll see next the moral "value" of the information or whether it is in our interest, or not, is more a matter of Venus or maybe Jupiter. Mercury only signifies the information as "relevant" or "irrelevant" to any subject. Because the interpretation of the information is so neutral, Mercury is not hesitant to process information even for a "bad cause" as long as it finds it "interesting." It is because of this we say that Mercury might at some point be giving us the sophist. As a person or profession, Mercury may be the broker, the agent, the intellectual, the consultant, the ambassador, the interpreter, the writer, the journalist, the publisher, the teacher, the student, the researcher, the psychologist, the therapist, the caller, the official mail, the librarian, the manager, the registrar or wireless data. As a location, Mercury could be associated with venues such as the market or the bank, but also with areas like schools or universities or other studying facilities. 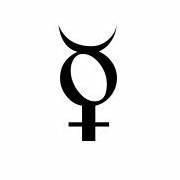 In political astrology, which refers to an entire state, Mercury represents communications and transportation, education, and media. It belongs to the element of air. It rules Gemini and Virgo. Its musical note is MI. The part of the body it corresponds to is the lungs (and the hands). Its ancient corresponding god is Mercury. It's neither a masculine nor a feminine planet. We could call it hermaphrodite. It manifests mostly before the age of puberty and at early adolescence. Psychologically Mercury represents the instinctive human ability to perceive its environment, to classify information and to communicate it to other people. Apart from others, the man is also asked to observe himself and to collect data to increase control over his own reactions. The method of self-observation is not as objective as we think. We learn to distinguish some data and pay attention only to them. An example is how some of us preferably focus on body language while others are concentrated on words themselves. The way we have learned to communicate something is not always consciously chosen. Part of the process of self-observation is to recognize these patterns and see how they affect us. Positive qualities: communication skills, intelligence, logic, expression ability, eloquence, thinking skills, healthy curiosity, neutrality in emotions which helps objectivity, teaching skills, learning skills, knowledge, sorting and relating skills, intellect, ability to make a judgment, adaptability, transaction skills. Negative qualities: relation to theft, crooks, easy lie, indiscriminate curiosity, gossip, chatter, nervousness, cunning, neutral emotions expressing as coldness, superficiality.